Taking my logan lathe apart MINDLESS BORING: for rebuilding proved there was no gib on the cross slide dove tail. The gib it self must have been missing for some time as the previous owner had the adjusting screws locked up tight and was using it for wood turning, missing compound hand wheel and all. For me this would not do, The logan 920 lathe has power cross feed to face large diameters and i wanted this to work. I had a nice piece of cast iron salvaged from an old stove grate that would be perfect for a long wearing gib strip,and fairly stable while machining. With out a surface grinder, making a nice fitting running surface was going to be alot of work. I elected to use a piece of soft steel bar stock standing in the corner for a few years. With the milling machine I removed the majority of the thickness leaving about .010 for finishing. Not finding any information about the angle of the cross slide dove tail on a logan lathe born in1952, I measured many times and decided on a 30 degree angle for the top and bottom of the gib with enough thickness to fill the gib slot. The only way i had to fix the gib angles was with the disk table on my belt sander and bench grinder. Hand fitting of the gib would be done with progressively finer files and finished with honing stones. 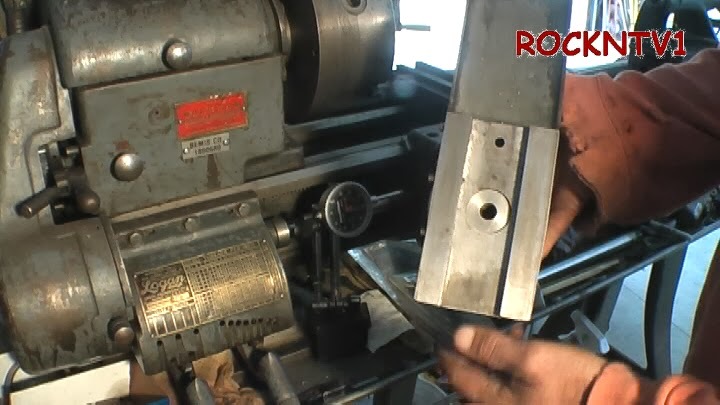 Watch how to make a lathe gib video.